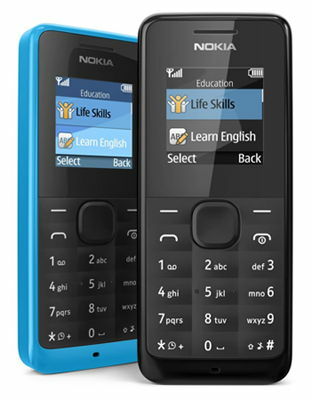 The Nokia 105 has a 1.45 inch colour display and can easily be viewed in bright sunlight. It has a square resolution of 128 x 128 pixels which gives a pixel density of 125ppi. The battery is only 800mAh, but the Nokia 105 does give up to 12.5 hours of talk time and 35 days of standby time. It has a speaking clock and the all important flashlight so you’ll never be in the dark. It also has an FM radio, calculator, calender and arrives with up to five games all preloaded. The device features call waiting, integrated hands free speakers and call forwarding. It also logs calls received, dialled, received and missed. The 105 measures 107 x 44.8 x 14.3mm and weighs 70g. The body of the device is available in black or cyan and is slim enough to fit comfortably into a pocket or bag. Its rubberised case is dust and splash resistant. It has a basic alphanumeric keypad with rubberised buttons and it also has a five way D pad for navigation with a back and select button on either side.